PHOENIX (June 24, 2009) It’s official: Phoenix is an All-America City – for the fifth time. National Civic League judges chose the city as one of 10 winners of the prestigious, nationwide competition. Phoenix was one of 29 finalists presenting at the 2009 All-America City Awards in Tampa Bay last week. 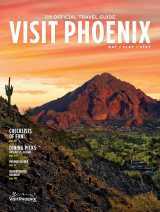 Phoenix is the only Arizona winner for the 60th annual awards, and the Greater Phoenix Convention & Visitors Bureau supported and donated to the presentation effort. About 60 people worked on the presentation and award application, including 40 community members and 20 city employees. Phoenix highlighted newly developed urban education campuses (Arizona State University’s Downtown Phoenix Campus and Phoenix Biomedical Campus), parks and land preservation strategies, and the city’s innovative library spaces for teenagers. The awards called for innovative, recent projects that meet major challenges and include the community in the process. Phoenix previously won the All-America City Award in 1950, 1958, 1980 and 1989. It is the country’s most prestigious community recognition award, honoring communities of all sizes for collaborative projects addressing critical issues.